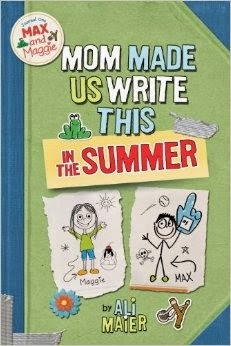 My mom received a copy of Mom Made Us Write This in the Summer for review on her blog. I read it for her and this is my review. This book is about two kids named Max and Maggie who are twins. Because their mom was tired of them fighting, she made them write a journal together. They have to write their journal about good and bad topics that they do in the summer, but each person gets to comment on the other person's entries. They learn more about each other and that the other one is not so bad. They also learn that, if they fight, they have to do work in the summer! I thought that this was a funny book when you got to read both of their sides. I liked that they both had to write about the same topics and that each entry tells you more and more about them. I also really liked the comments on both of their entries that the other one wrote and how they picked topics just to annoy the other person. At the beginning, I think they really didn't want to write it, but at the end, it seemed like they were sad that it had to stop. Hmmm....sounds just like your Mom and Uncle Scott...or you and your sister! Great job, Ben!